Happy 2015 everyone! I hope you all had a great holiday season and I wish you all the best for this new year. How crazy is it that it is 2015? I think I am still in denial! One of my resolutions is to get back on this whole blogging shebang again. I have been making excuses and pushing it aside, but the truth is that I really miss blogging and having a place to write. I hope to be updating a few times a week with product reviews, more in depth information about my videos and favorite items, and fashion posts as well! Apart from blogging, I will hopefully be posting videos more frequently as well! I wanted to catch you all up on a few things that have been going on on my YouTube channel. This past December, I decided to do Vlogmas – which is vlogging my daily life every single day from Dec. 1 to Christmas. I had the BEST time sharing my daily life with my subscribers and it was a wonderful way to get in the Holiday season. If you haven’t watched those videos yet- you can catch up here. Towards the end of the month, I went to Disney World with my family for Christmas and I am so glad I was able to capture our trip and share it. I will always remember it and it was so amazing and special to be there during the holidays. I think I am a 5 year old trapped in a 27 year old body. LOL! 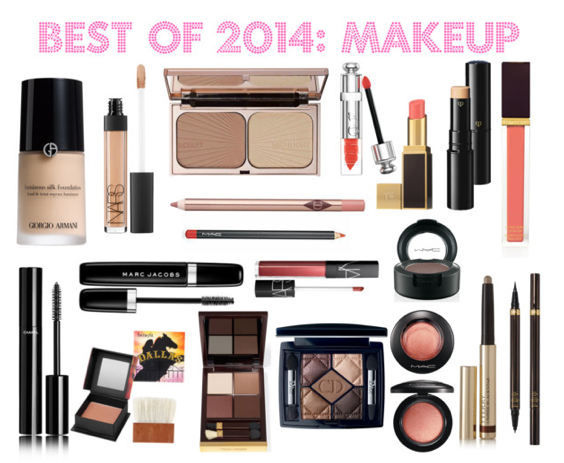 Now you have arrived at the main purpose of this post and it is to talk about my favorite makeup items from 2014! This has been my third year in a row making this type of video and it is a great reference if you want to hear some of my holy grail product recommendations. I have a separate video coming up that will concentrate on the top skincare, body care, and haircare, but the makeup one is live now! It’s hard to believe we only have two months left in this year. Time has flown by at an incredible speed this year, it is crazy! On my YouTube channel, I make monthly beauty favorites where I talk about beauty products that I have been obsessed with over the last month. Usually they are newer products that have made their way into my collection, but I also include old favorites (or rediscoveries as I like to call them) that I have been using a lot too. I was traveling a lot during October so I used a lot of items that are versatile and easy to travel with. I discovered a lot of great goodies and it’s a pretty long video so grab a cup of coffee (or a glass of wine) and enjoy! What have been your favorites this past month? Welcome to my beauty blog where I will be sharing my favorite beauty products, product reviews, fashion inspiration and outfit posts. I hope you enjoy!